Home / GST-Tally / TallyERP.9 Lessons / How to Deactivate VAT, Service Tax and Excise in Tally? How to Deactivate VAT, Service Tax and Excise in Tally? From 1st July onwards VAT (Value Added Tax), Service Tax & Excise Duty subsumed in GST. But return for all these taxes is still to be filed (except Excise). From 1st July assessee raised all bills of goods and services with GST tax. 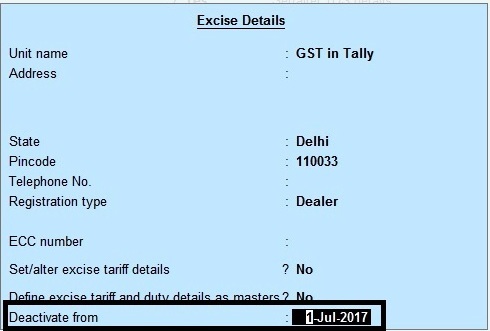 Assessee can charge tax as per applicable GST Rates. Tally make software very easy to use for their users. Specially small traders whose are very badly effective with GST and puzzle how to maintain their accounts. 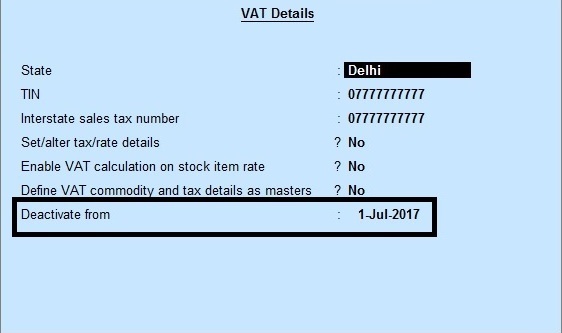 So In Delhi Last date of filing of DVAT Return is 25th July 2017 (not extended yet) and Service Tax return last date is 15th August 2017. Read Also: How to enter GST Payment Voucher in Tally? After that you do not need to work for VAT, Service Tax and Excise. So you can deactivate all these taxes in Tally for safer side. How to Deactivate VAT in Tally. To deactivate VAT Feature in Tally. Create a accounting Voucher - Press F11 - F3 go to Enable VAT - Yes - Alter Vat Details - Yes and enter deactivate date from 01-07-2017. Press F11 to Gateway of Tally and Select Statutory and Taxation - Enable VAT - Yes - Alter Vat Details - Yes and enter deactivate date from 01-07-2017. Same settings will be applicable for Excise & Service Tax.